Hello, lovelies~ Do you remember a local brand that has one of the cutest packaging? Gwendolyn always has a girly and sweet design on their product labels. As always, Gwendolyn always has the labels with girl characters that are just too cute and adorable. This one has a sweet floral scent that are subtle. It isn't too strong, more of a soft floral scent. 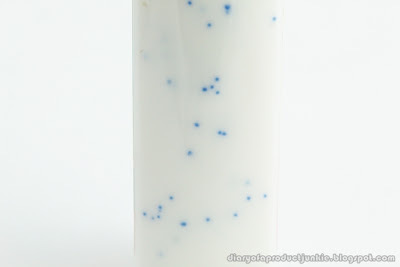 The lotion is a light pink color with blue beads inside it. The texture is slightly thicker than a lotion, but not as thick as a cream. I applied it on my hands when they are slightly in a dry condition. This is a two in one product that moisturizes and cleans hands at the same time. 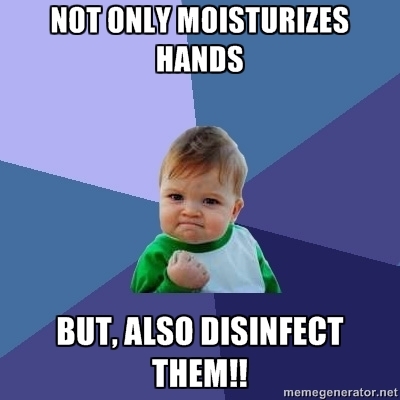 It contains Triclosan as an active ingredient to clean the hands of germs. Vitamin E and Jojoba Oil are the ingredients that help to moisturize the hands. The downside to this product is the slight stickiness after I've applied it all over my hands. It doesn't absorb quite as quickly as my other hand creams. If my hands are very dirty, then I would use wet wipes or wash them under a sink. In summary, I liked the label design and packaging, but I just wished that they would've sink faster into the skin and less sticky.